This year has been good to gaming. Hold on, let me restate that. This year has been amazing to gaming. To me, it feels like this year was this generation's swan song, the last push of gaming before all the developers go find some foxhole to hide in while they develop games for the PS43 or the XboxKickflip. 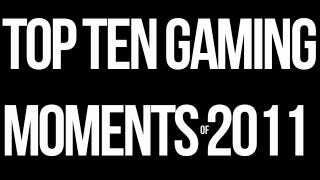 Check out my Top 10 Beautiful (moving, incredible,awe-inspiring) Gaming Moments of 2011. The Augusta National may as well not even exist for your average golf fan. Hell, it shouldn't exist for your above-average golf fan. This super exclusive golf course is reserved only for the pros, and up until Tiger Woods 12, it was barely in any video games. The feeling of being able to put your skills to the test, on a patch of grass you know for a fact that your feet will never be able to step foot on, is almost religious in its experience. Sonic Generations makes you forgive the past 10 years of the war crimes they called Sonic games. It wasn't until the City Escape level that it really hit me. Sonic is back, and he isn't going to take crap from anyone. Even the cheesy song that seemed so annoying way back when, feels so incredibly perfect now. I don't often let nostalgia cloud my judgment, but it's not often you see something climb so high after being so close to rock bottom. There are a lot of games that make you play as a god, but this year's From Dust gives you this weird, almost personal connection to the little guys you follow around. As they explore, you explore and as they approach dangerous terrain, you follow. The only difference between you and the villagers is that they can all die, and you cannot. There's a pit in your stomach that forms when you realize that the very first tidal wave is coming. You zoom in on your little dude, running as fast as he can to bring some special song back to the village. This way, everybody can sing and dance and push the crushing waters away. If you zoom in really close, you can even hear him panting and weezing as he books it across the sand dunes. Then it happens, just in the nick of time: the waves split and the village is saved. From the first moment you start Child of Eden to the second you turn it off, your mind should be blown. If it isn't, I'm pretty sure you aren't human and I don't like you. The game entrances you, overloading your senses until you are completely lost in the sounds and sights of Eden. Then you see the blue whale. From the sea to space, you attack this amazing enigmatic blue whale. What happens when you think it's finally all over and done with? It explodes into a bunch of stars and forms into a phoenix. The Blue Whale explodes…into a bunch of stars…and becomes a phoenix. If this scene doesn't have you in awe by the time your score is tallying, I don't know what will. L.A. Noire is a beautiful game. The cars, the actors and the settings all are incredible sights to see. There is something captivating about getting closer and closer to solving the biggest case of your career, being led around by a psychopath who is dropping clues and notes all over the city. With each clue, you find yourself being led to more dangerous locations. Soon you find yourself stuck in the rain, running through an incredible set from the film Intolerance. Rickety beams, giant plaster elephants and a murderer that could be around any corner... the scene is simply breath taking. Then it all starts to collapse and you gotta make it out of there alive. You can get lost in the sheer vastness of the desert, slowly trudging along, thirsty and beaten down. Presenting both graphical beauty and the feeling of desperation, the desert level in Uncharted 3 achieves something rarely seen in games. Skyrim is a game known for its beauty, and talking about that almost seems redundant at this point. The one thing that really stands out beyond all of the dragon-killing, epic mountains and deep forests is the sky—the vast gorgeous sky. When the sun sets, the real beauty shows up. The Aurora Borealis in Skyrim will stop you in your tracks the first time you see it. El Shaddai doesn't have one beautiful moment that I can pinpoint, but I can say that every second of that game is a visual masterpiece. The worlds feel alive, the colors are vibrant, and it feels as epic and massive as it tries to be. Nothing about the game's combat is really all that amazing, but when it comes down to it, the game is truely one of the most visually amazing games of 2011. Besides being one of my favorite games Bastion is one of the most memorable games of 2011. As you dig into Bastion, it gets darker and more intense. Soon, you'll find yourself being led by a soft song that floats through air. Amongst the massacring of all these evil little creatures you get closer to the voice, until you finally meet a beautiful songstress singing by a small fountain. Such a serene moment amidst all the chaos just sticks with you long after you have finished playing. What can I say about Portal 2 that hasn't already been said? It has an incredible script, incredible voice acting and every environment is more epic then the last. Choosing which scene to pick was incredibly difficult. The ending scene is really one of the most memorable moments in gaming. After years of playing Portal and the epic journey that is Portal 2 you finally "defeat" GLaDOSs and see the light of day. After a long elevator ride, some singing robots and a half-hearted apology from our robotic antagonist, we are pushed out of a door that leads to some wheat farm. With no idea where or when we are, we are breathing fresh air, and right before the credits roll, everybody's favorite companion cube gets spit up from the very belly of the beast. Burn marks and all.